The demand for district heating and cooling systems has continued to expand at a significant level across the globe in the past few years. Factors such as long term cost-savings, excellent ROI, government incentives, flexibility of fuel options, and strict environmental laws concerned with energy efficiency of a variety of systems have been central to the growth of the market in the past. Transparency Market Research estimates that the global market for direct heating and cooling systems will expand at a 5.8% CAGR in terms of energy sales volumes over the period between 2016 and 2024. In terms of revenue, the market is expected to exhibit a 6.2% CAGR over the same period. As a result, the market is expected to reach to a revenue-wise valuation of US$243.42 bn by 2024. In terms of energy sales volume, the market is expected to reach 12,187,491.8 tera joules by 2024. The global market for district heating and cooling is clearly dominated by the district heating market, which accounts for over 95% of the market’s overall shares and is the key consumer of the variety of distribution components used across district heating and cooling systems. Of the key distribution machinery and tools used across several applications in the district heating and cooling market, including pipes, valves, and pressure pumps, the segment of pipes is presently the dominant. It accounts for a share of over 60% of the global market’s overall revenues and is expected to retain dominance over the next few years as well. The constant expansion of pipeline infrastructure globally, the rising share of pipes in DHC distribution systems owing to the need for timely renovations, and falling prices of pipes have all contributed towards the increased share of pipes in the market’s overall valuation. On the other hand, the demand for pressure pumps is expected to rise owing to factors such as an increasing number of DHC systems across key regional markets, increasing capacities of DH and DC systems, expanding networks of distribution infrastructure, and predefined expansion targets by 2020. The segment of valves is expected to benefit from the rising number of customers being served by DH and DC systems, rising number of substations, and increasing lengths of pipelines. Asia Pacific is presently the leading regional market for district heating and cooling systems, accounting for a share of nearly 55% of the global market in 2015. The regional market had a valuation of US$147.7 bn in the same year and is expected to exhibit an impressive CAGR over the period between 2016 and 2024 as well. In terms of energy sales volume, the Asia Pacific DHC systems market is expected to expand at a 6.9% CAGR over the said period. South Korea, China, and Japan are some of the key countries driving the DHC market in the region. Factors such as the importance of energy efficiency and renewables, rising temperature levels, and government initiatives supporting the establishment of DH and DC systems across municipalities are expected to drive the market in the next few years. Europe followed Asia Pacific in terms of share in the global market’s revenues. In terms of revenue, the Europe DHC market is expected to rise at a 5.1% CAGR over the period between 2016 and 2024. Consistently low temperatures throughout the year with only a few months of summer have boosted the sales of district heating in Europe in the past few years. In the next few years, several stringent regulations regarding the increased usage of renewable energy sources and the Europe 20-20-20 targets are expected to boost the demand and installation of district heating and cooling systems in the region. Some of the most notable vendors operating in the global district heating and cooling market are Emirates Central Cooling Systems Corporation (EMPOWER), Logstor A/S, Emirates District Cooling LLC (Emicool), ADC Energy Systems LLC, KELAG Wärme GmbH, Emirates National Central Cooling Company PJSC (Tabreed), Ramboll Group A/S, Keppel DHCS Pte. Ltd., Shinryo Corporation, and Tekla Corporation. The district heating and cooling (DHC) market report by Transparency Market Research provides in-depth analysis of the district heating and cooling market globally. The report segments the market on the basis of geography. The report analyzes the global district heating and cooling market in terms of both energy sales volume (Tera Joules) and revenues (US$ Mn) for the years 2016–2024. For this research study, the base year is 2015, whereas the forecast is from 2016 to 2024. The report also provides investment figures by DHC players in district heating and cooling generation (boilers and chillers) and distribution (pipes, pressure pumps, and valves). The report provides a comprehensive competitive landscape and features companies manufacturing district heating and cooling systems. This report includes the key dynamics affecting the district heating and cooling market globally. The analysis in the report provides detailed insights of the global district heating and cooling market. The drivers, opportunities, and restraints of the market were analyzed in detail and are illustrated in the report. The report also provides a detailed industry analysis of the global district heating and cooling with the help of the Porter’s Five Forces Analysis model. The research report is divided into the consumption, generation, and distribution segments and further broken into the components of each segment. DHC generation segment is further segmented into chillers and boilers. DHC distribution segment is further segmented into pipes, pressure pumps, and valves. The district heating and cooling market has been segmented geographically into four regions and further into 16 unique country sub-segments. The regional segments are Europe, Asia Pacific, North America, and Rest of the World. The 16 countries which have been separately addressed in this report are the U.S., Canada, Mexico, Sweden, Austria, Germany, France, Finland, Poland, South Korea, Japan, China, India, Taiwan, and the GCC countries. District heating systems dominated the global district heating and cooling market in terms of both energy sales volumes and revenues. In terms of DHC generation, boilers dominated the market across the globe. In terms of DHC distribution, pipes dominated the global market, followed by pressure pumps and valves. 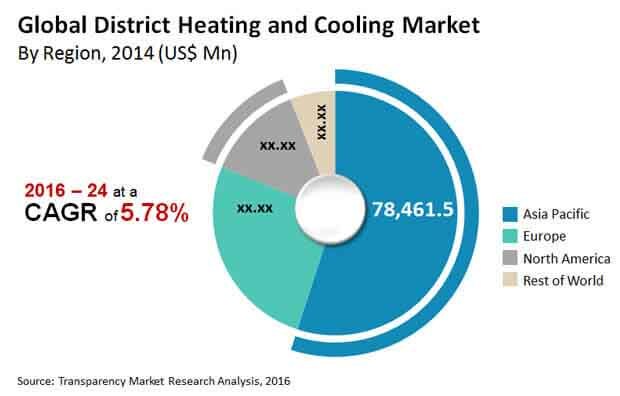 Asia Pacific held the major share of the global district heating and cooling (DHC) market in 2014, accounting for more than 50% of the global market share in terms of sales volume. Europe was the second-largest market for district heating and cooling systems, followed by North America in 2014. Rest of the World (RoW) held the fourth-largest share of the global district heating and cooling market in that year. Asia Pacific held the major share of the global district heating (DH) market in 2014, accounting for more than 55% of the global market share in terms of sales volume. North America held the dominant share of the global district cooling (DC) market in 2014, accounting for more than 50% of the global market in terms of sales volume.